In June of 2017, The Portland Clinic Foundation announced its first round of public grants, distributing $30,000 to 16 remarkable nonprofits ranging from the Coalition of Communities of Color to the Sexual Assault Resource Center, to the Good Neighbor Center to the Hollywood Theatre. Today, we are happy to showcase the North by Northeast Community Health Center. 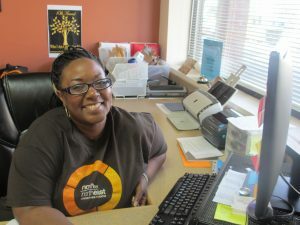 Founded in 2006, NxNE was conceived after Pastor Mary Overstreet Smith helped 40 families affected by Hurricane Katrina, settle in North Portland. Sourcing accessible medical care for them proved difficult, however, and upon further review of her resources, Smith soon discovered this problem was widespread. Many members of North Portland’s African American community had been going without access to regular, affordable healthcare for years. NxNE was created to fill that gap in provision. As an independent nonprofit clinic, NxNE provides uninsured and Medicaid patients with carefully tailored care to meet specific health needs of its primarily African American neighbors. “For a community that’s experienced a lot of disenfranchisement, even within healthcare organizations that are meant to help and heal, we strive to be a place where our neighbors can walk in and feel like this place is for them,” says NxNE Executive Director Suzy Jeffreys. NxNE works to remove barriers to good health by ensuring easy and welcoming access to care. The organization provides flexibleappointment schedules and enrollment specialists to help patients with insurance registration, and it loudly spreads the word about the importance of preventative healthcare. “We’re out in the community constantly, providing blood pressure screenings. You can find us at health fairs, block parties, street fairs, you name it,” Jeffreys says. Heart health and hypertension have been a primary focus for NxNE. One of their most innovative programs is Cuts & Checks, an initiative that began when five local barbershops agreed tohost blood pressure monitoring stations, allowing clinic staff to provide accessible screenings, guidance and follow-up. Building on this success, NxNE is now partnering with a barber training college to teach aspiring barbers to conduct hypertension screenings. “There’s a long history of barbers as health promoters in the community,” explains Jeffreys. Throughout February, Heart Health Month, NxNE’s Ambassadors and staff have been even more ubiquitous, performing blood pressure checks, offering heart-healthy snacks, hosting raffles for free haircuts and distributing celebratory Black History Month materials. NxNE’s persistence has paid off, Jeffreys notes. “We’ve had some big successes in the past few years, and in 2017, we reached our goal of helping 75% of our hypertension patients control their blood pressure.” She attributes that success to NxNE’s willingness to pursue patients’ health wherever and however needed. 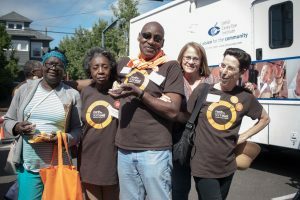 If you would like to help The Portland Clinic Foundation support nonprofit organizations like North by Northeast Community Health Center please consider donating today! Giving is easy: you can donate online, send in a check, include TPCF in your estate plans, or, if you are TPC employee, set up a payroll deduction today! To learn more, visit www.theportlandclinic.com/foundation or call 503.221.0161 x 2154. One hundred percent of all contributions go straight back to Portlanders in need!